Gherardi (DMS-30) was the only ship in a squadron of 11 high-speed minesweepers (also called destroyer minesweepers) that escaped damage by kamikaze attacks during the Battle of Okinawa. This book's author Paul Thurman served as Fireman 2nd Class during World War II in Gherardi's engineering department, which provided propulsion, electric power, and water for the ship. 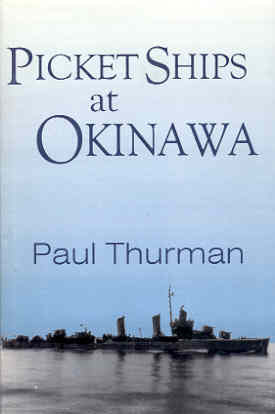 About one third of the book Picket Ships at Okinawa describes the author's personal wartime experiences, and the rest summarizes damage to the Allied fleet and casualties from March 20, 1945, to the end of the war. The term "picket ships" in the title refers to destroyers, destroyer escorts, high-speed minesweepers, LSTs (landing ships, tank), and other smaller ships that detected incoming kamikaze aircraft by radar and frequently fought them at 16 picket stations encircling Okinawa about 40 to 70 miles from the island. The picket ships protected the fleet's larger ships such as carriers and battleships by warning them of incoming enemy aircraft and providing CAP (combat air patrol) fighters time to engage them before they reached the main fleet. The author mentions his disgust for a statement made by an American admiral after being asked about damage inflicted on the fleet by Japanese kamikaze. The admiral said that "most of the American ships hit were of less valuable characteristics" (p. 23), even though these smaller warships at picket stations had been protecting the fleet's larger ships. Although the title mentions picket ships, the book's summary includes all ships in the Allied fleet damaged or sunk from March 20, 1945 (a somewhat arbitrary date selected by the author since minesweeping operations around Okinawa began then). The author used six primary sources (e.g., Summary of War Damages, which was an official U.S. Navy record) to compile the book's listing of 304 ships damaged or sunk, and each entry includes a reference to at least one of these sources and the page number. The listing includes damage not just from kamikaze aircraft but also from mines, conventional bombs, collisions, suicide motorboats, and other causes. Most entries contain very little detail, such as the following one (p. 68, entry 175), "On April 28, the LCI 580 was damaged by a kamikaze." One entry mentions the author's personal involvement, when the destroyer Mullany (DD-528) got hit by kamikaze aircraft, and Gherardi arrived soon thereafter to pick up survivors from the sea. The eight photos in the middle of the book demonstrate the terrible damage caused by kamikaze attacks. The parts of the book with Thurman's personal experiences contain some interesting episodes, such as a fight with three marines in Panama, but the book lacks firsthand accounts of kamikaze attacks. Thurman primarily wanted this book to provide Pacific War veterans with a compilation of damage inflicted by the Japanese on American ships during the last few months of the war. In addition to the individual entries on specific ships, several pages (112-4, 134-8) contain various summary statistics regarding damaged or sunk ships and the number of casualties during the Okinawan campaign and during World War II. For example, the author notes that his summary listing indicates the most frequently hit ships were destroyers, with 81 damaged and 12 sunk. Converted destroyers (destroyer minelayers, destroyer minesweepers, and APDs (destroyer transports)) totaled 39 damaged and 4 sunk, while landing craft (LSTs, LSMs, LCSs) accounted for 22 damaged and 13 sunk. Destroyer escorts had 22 ships damaged and 1 sunk. As can be seen from these statistics, the smaller picket ships took the brunt of kamikaze attacks. Although this well-documented book provides brief informative summaries of ships damaged or sunk near the end of the Pacific War, most information on what happened to a specific ship can be easily found nowadays by referring to Internet sources.